We used to be skeptical of breakfast cookies. Can a cookie really be healthy enough to serve for breakfast? Thankfully we discovered that using seed or nut butter as the main ingredient for a cookie, creates a high protein and nutrient dense cookie that is healthy enough for breakfast. Instead of using oats, which are very common in breakfast cookie and granola bar recipes, we wanted a recipe that would work for all of our clients, including the ones that can’t eat grains or gluten. You’ll find that this recipe is still filled with seeds, coconut, and dried fruit – the usual suspects in granola bar recipes (plus we added in cacao nibs for even more flavour and crunch). 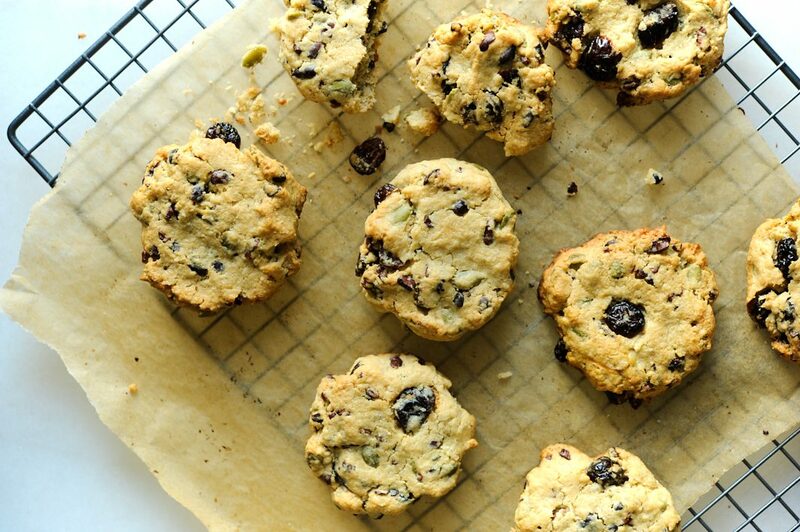 These breakfast cookies are based on a recipe that one of our private chefs, Lara Rae, shared with us. Lara has been a part of our team for over a year, and prepares delicious food for our clients in their homes. We hope you love this recipe as much we do! We’d love to see photos if you make this recipe at home. Share your photo and tag us (@livingkitchenco) on Instagram, Facebook or Twitter! Form into small cookies. We usually make around 14 to 16 cookies. Bake for 15 minutes, or until just lightly browned on top.